Although the words “root canal” are intimidating to most people, the actual procedure is less difficult than it has been made out to be. Root canals are essentially a full-tooth cleaning and filling to preserve your tooth. Tooth decay, infections, injuries can leave the tooth's soft tissues damaged, causing pain, dental abscesses, and eventually tooth loss without treatment. However, root canals can preserve the tooth to protect your appearance, your ability to chew, and ultimately, your health. Root canals are nothing to be afraid of, and most people who undergo a root canal for the first time report that it just feels like a longer dental visit. Root canals are needed when the inner pulp of the tooth becomes inflamed or infected. This can cause bad toothaches that can make it hard to talk, chew, or even sleep. If you have teeth that need a root canal, they might be extremely sensitive to hot, cold, sweets, and pressure. It might be difficult to bite down on foods even if they are soft. Infections and pressure in the pulp chamber can eventually kill your tooth, which can change the color of the tooth from white to gray. Some patients who need root canals experience gum tenderness, swelling, or pimple-like bumps on their gum line. All three of these symptoms are signs of serious dental infections called abscesses. "Root canals are nothing to be afraid of, and most people who undergo a root canal for the first time report that it just feels like a longer dental visit." 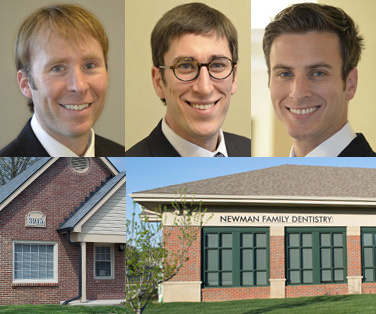 Before scheduling your root canal, Dr. Newman will examine your teeth and gums closely to determine whether or not endodontic therapy would help. X-rays are used to see how far the infection has travelled, and medications like antibiotics may be given to you to curb the infection before the procedure. Like any other dental restoration, root canals begin with the area around the tooth being numbed. Patients may also be administered nitrous oxide to help them stay calm and relaxed during the treatment. Because the goal of root canal therapy is to remove interior dental infections, preventive measures need to be taken to keep the infection from spreading and to keep the damaged tooth clean and dry. To do this, Dr. Newman places a rubber dental dam around the tooth. This tent-like device helps the doctor to keep the area clean and tidy. Next, a small hole is drilled through the crown of the tooth to access the damaged pulp. During a root canal, all of the tiny blood vessels and nerves are removed from the tooth to eliminate pain. Special instruments are used to clean the inside of the tooth, and the area is sanitized to remove infection. Very small, flexible dental files are used to shape the inside of the root canals that extend into the jaw. This step is necessary because it helps the dentist to fill and seal the space, which prevents future infections. A special paste material called gutta-percha is used to fill the inside of the tooth. After the body of the tooth is filled, a large filling is used to seal the top of the tooth, and then a temporary crown is placed to protect the tooth until a permanent version can be made. Root canal recovery is very straightforward, and typically involves a very small amount of discomfort that can be controlled with over-the-counter medications like Ibuprofen. Most patients are pleasantly surprised with how straightforward the process is, and how much better their tooth feels afterwards. If you are having problems with one of your teeth, make an appointment with your dentist in Indianapolis today.